A BullCharts "template" is basically a single price chart, including any number of indicators, and with specific colours and timeframe. Eg. 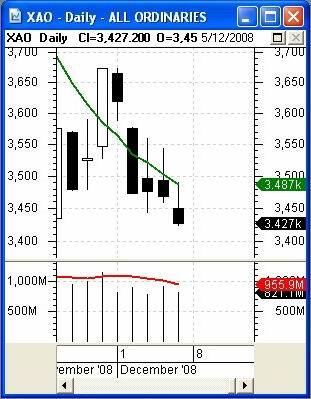 the sample shown here is a Daily chart and has a Moving Average on the price plot shown in green, and a Moving Average on the Volume pane shown in red. And, these moving average lines are thicker than normal. This chart could also have had a number of indicator panes. You can save a "template" like this sample, and then apply it later to a new price chart. You can also take whatever the current on-screen price chart looks like, and save it as the "Default Template" to be applied automatically every time you create a new price chart. Right click the mouse anywhere over a blank part of the price chart and choose "Set as Default Template". Use the Ctrl + t keys. There are some options to define the behaviour of the templates when applied. Refer to the menu option: Tools > Preferences > Templates tab. Note here that "Edit Template Toolbar" is one option. For an explanation of where the template files are stored, and how to manage them, see a future weekly newsletter. Likewise, for an explanation of the Template Toolbar and how to add and rearrange toolbar buttons, see a future newsletter. Also see the BullCharts on-line help (in BullCharts, hit the F1 key), and the User Guide Chapter 9 (this is supplied with the software and copied to your hard drive as a PDF file). 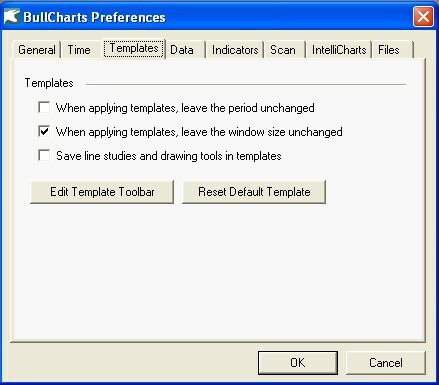 On the BullCharts* Line Studies toolbar there is a button to toggle the cursor "crosshair" on and off (indicated with a red circle near the top left of the screen shot above). In this screen shot, the crosshair is turned on and it is represented by the two fine lines that cross on the big white candle on 28 Nov. Accompanying the crosshair is the tag on the vertical price scale (shown here on the right as "3.579k"), and the tag on the horizontal time scale (shown here as "28/11/2008") - both of these are highlighted here with a red ellipse. As you move the cursor around the screen these values are dynamically updated to indicate the cursor position on the screen. How is this useful? - The vertical line runs all the way down the screen, through the price plot, and into the Volume pane, and across any separate indicator panes that might be visible above and below the price pane. So you can line up a feature or pattern across all the panes. Or across the chart, you can easily line up key features like price highs or lows, or support/resistance patterns, etc. 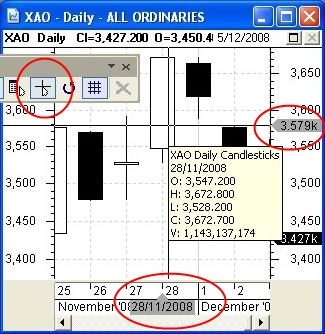 As normal, when you hover the mouse cursor over a candle, an information box is displayed with the properties of the candle displayed (as in the figure above).